Some of us just can’t grapple getting up in the morning; the sheer thought of having to leave your warm cosy nest to begin your day is not enticing and that, hand in hand goes with having to get out of bed while it is dark and dull outside. The Lumie BodyClock Active 250 sunrise alarm clock can give you the get-up-and-go you and your family need for those routine driven mornings. 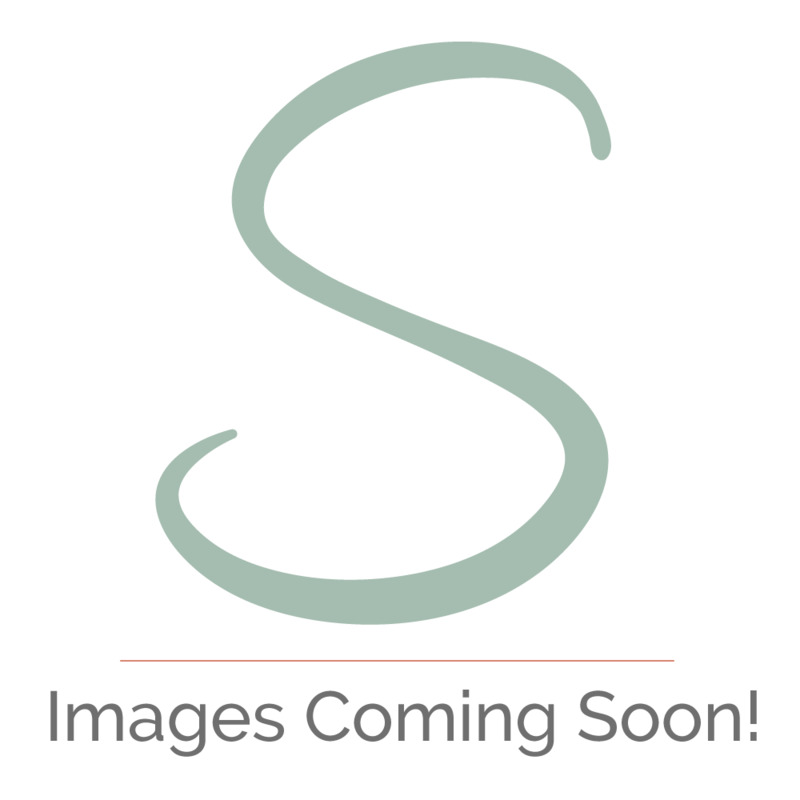 Is your home gifted with a hormonal teenager? Cortisol is a hormone that is found in each and every one of us; it’s known as the stress hormone – cortisol controls some functions in the body that respond to stress. If your child has abnormal cortisol levels, they may stay up too late or wake up prematurely, finding it difficult to fall back to sleep, resulting in one stressful, hormonal teenager! Along with cortisol, comes melatonin; a hormone that is released during the later hours of the day into the evening and remains at its peak for the most of the night. Melatonin helps you to relax and fall to sleep; many teenagers’ melatonin levels release is delayed leaving them to be awake for longer but stay in bed longer the following morning. 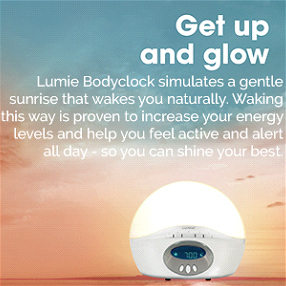 The Lumie Bodyclock Active 250 helps to regulate hormones to keep the body in balance the way nature intended - It wakes you gradually with increasing natural light. This is a natural signal for your body to ease production of sleep hormones (e.g. melatonin) and increase those that help you get up and go throughout the day (e.g. cortisol). 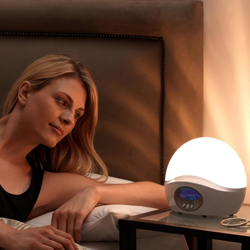 The Lumie light alarm clock wakes you with a gradual brightening light, simulating a sunrise. The gentle wakening is easy on your eyes which will make you feel more alert refreshed every morning. With the dawn simulator, it helps regulate your sleeping and waking pattern too; determining which hormones need a gentle boost. And don’t worry, if you’re a deep sleeper and don’t naturally stir in the morning, the Lumie light has a sounded alarm that can be a useful, helping hand. You can wake up to your favourite radio station, standard alarm beep, or you can wake up to a dawn chorus or, if you’re an early bird, wake up to a friendly rooster. The Lumie BodyClock Active works the other way too; if you or your child find it difficult to fall asleep or stay asleep, the Lumie light has a sunset feature that helps you to wind down and relax as the light slowly fades into darkness - a gentle and natural way to unwind. The Lumie light also has an array of sounds that can help you drift off; gentle waves hitting the shore or white noise to mask distracting background noises – it can be like the flick of a switch for young ones. Wondering how this little light of magic does all this automatically? Well, you can set your Lumie light to fade or brighten in minute increments from 15 – 90 minutes, aiding a healthy sleep and waking cycle. 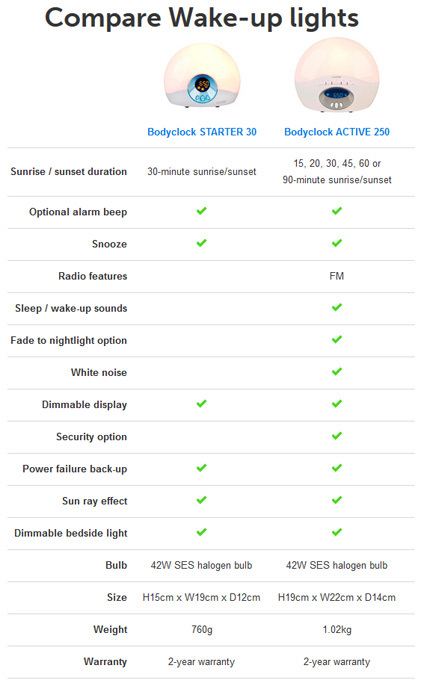 What are the proven health and well being benefits of using a dawn simulator wake up light? Proven links to raised levels of cortisol on waking (only seen in the DS group) - Cortisol helps to maintain blood pressure, immune function and the body's anti-inflammatory processes. Waking up with dawn simulation resulted in a significant reduction of sleep inertia (a feeling of grogginess immediately following an abrupt awakening. The impaired alertness may interfere with the ability to perform mental or physical tasks). Dawn simulation vs. lightbox treatment in winter depression - patients in both groups felt better and this was reflected in their reduced depression scores, on average 57% lower in those using bright light and 40% lower with dawn simulation. What do get with the Lumie Bodyclock Active 250 (apart from a great nights sleep and a hugely productive next-day) that is! Settings back-ups: optional alarm beep and power failure back-up to retain your favourite settings.